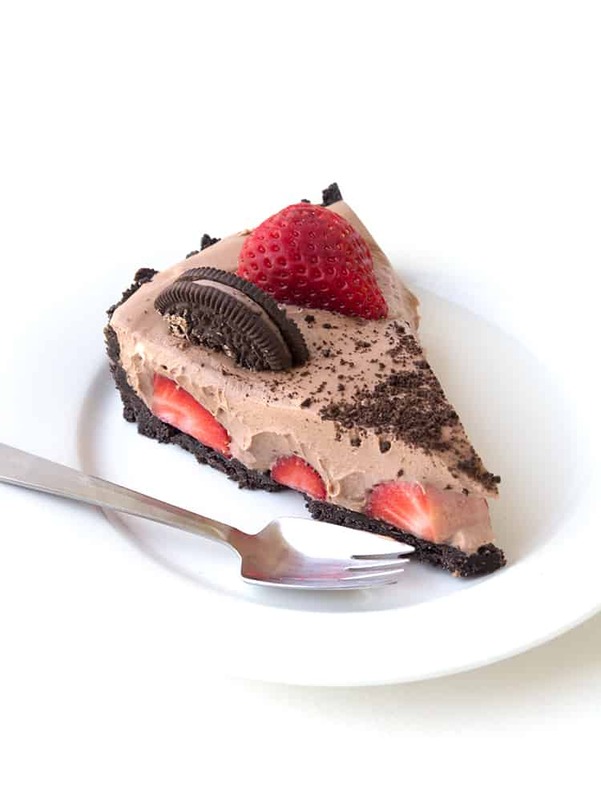 A super easy 5 Ingredient No Bake Strawberry Chocolate Pie. 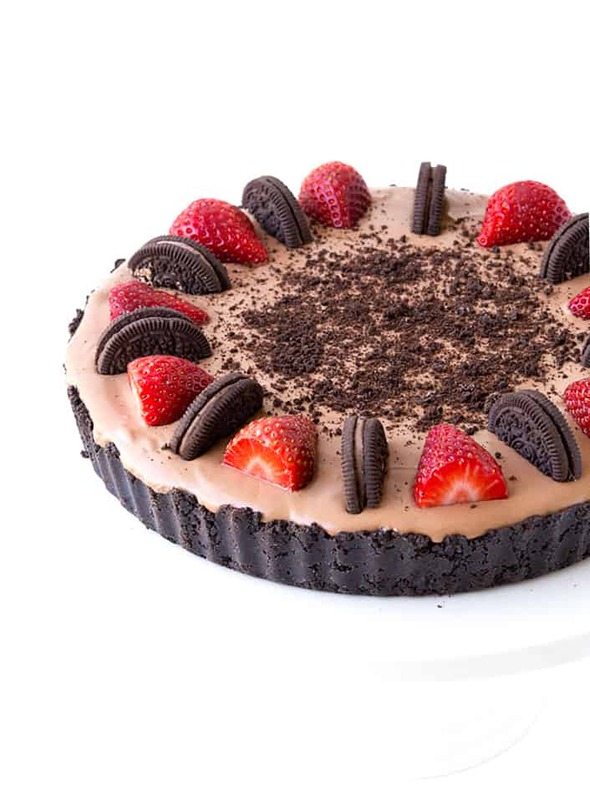 This no bake dessert has a crunchy Oreo crust and a creamy real chocolate mousse filled with fresh strawberries. Boy oh boy, do I have a treat for you! 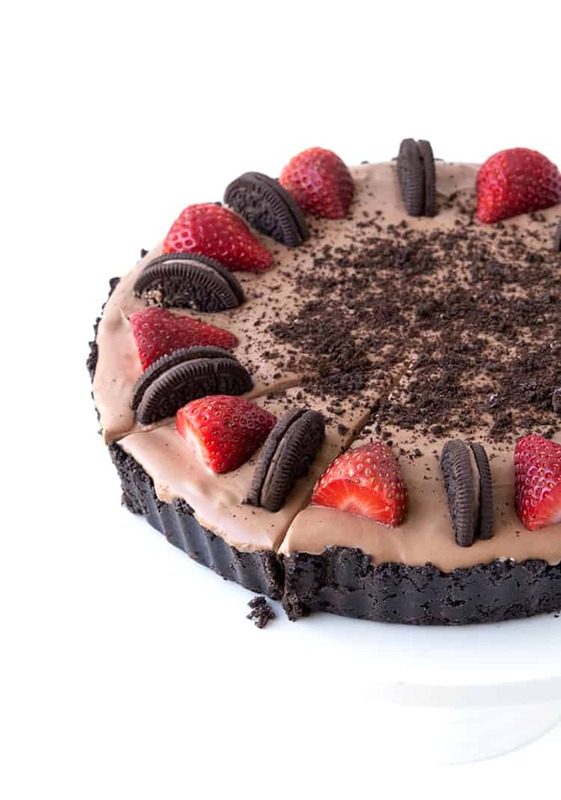 There’s chocolate, there’s Oreos, there’s whipped cream and fresh strawberries. This No Bake Strawberry Chocolate Pie comes together in just 10 minutes but will be devoured in seconds! 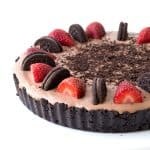 With a crunchy Oreo crust, a dreamy chocolate mousse filling and loads of juicy strawberries, it’s a decadent, yet deliciously easy, dessert. What do we love most at Sweetest Menu? Desserts and sweet treats that look amazing, taste amazing but are a cinch to make. And it does not getting any easier than a 5 ingredient no bake pie. You don’t even need to turn the oven on! You can throw this pie together the night before your next gathering, and then whip it out at the last minute to wow your friends and family. That is, if you can stop yourself diving spoon-first into that silky smooth chocolate mousse! After crushing your Oreo cookies and making the base of your pie, you then add a secret layer of fresh strawberries. The final touch is a mountain of velvety smooth chocolate mousse made with dark chocolate. Pop your pie in the fridge overnight and then it’s time to decorate with more strawberries and Oreo cookies. It’s as easy as that! 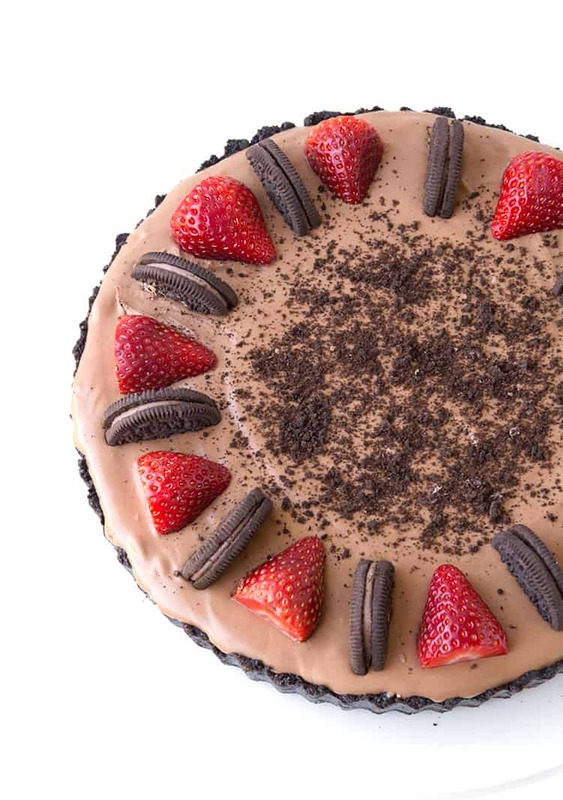 There’s no trick to this pie, just the perfect combo of strawberry, chocolate and Oreos. So how are yooou? It feels like it’s been a long time since I’ve really had a chance to drop in and say hi. The last few weeks have been extra busy so I feel like I’ve only zoomed in and out with a new recipe here or there. But there are exciting things happening, including some behind-the-scenes changes coming soon to SM. I can’t say more just yet, but don’t worry, I’ll keep you posted! But for now, let’s eat PIE. 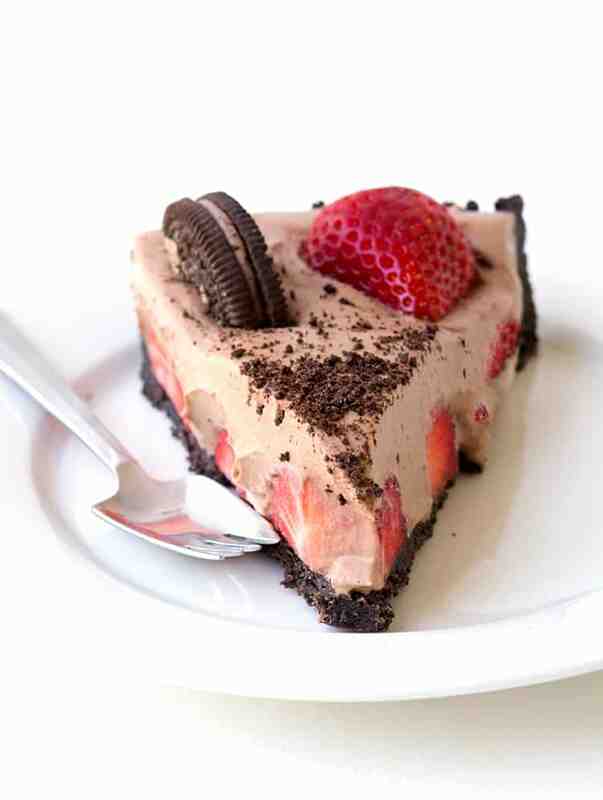 An easy no bake Strawberry Chocolate Pie with fresh strawberries and an Oreo cookie crust. Cut off the tops of your strawberries and then cut them in half. Set aside. Next chop your dark chocolate into small chunks and place into a bowl. Then heat 1 cup of cream in the microwave until warm (do not boil), pour over your dark chocolate and leave for 2-3 minutes. Then whisk your dark chocolate mixture until smooth. Leave to cool for a few minutes. Meanwhile start whipping the remaining 1 and 1/2 cups of cream until it resembles stiff peaks. Then fold your whipped cream into your chocolate mixture very gently until fully incorporated. Get your Oreo base out of the fridge. Place strawberries all over the bottom of the pie. Then pour the chocolate mousse on top. Refrigerate for at least 4-6 hours or overnight. 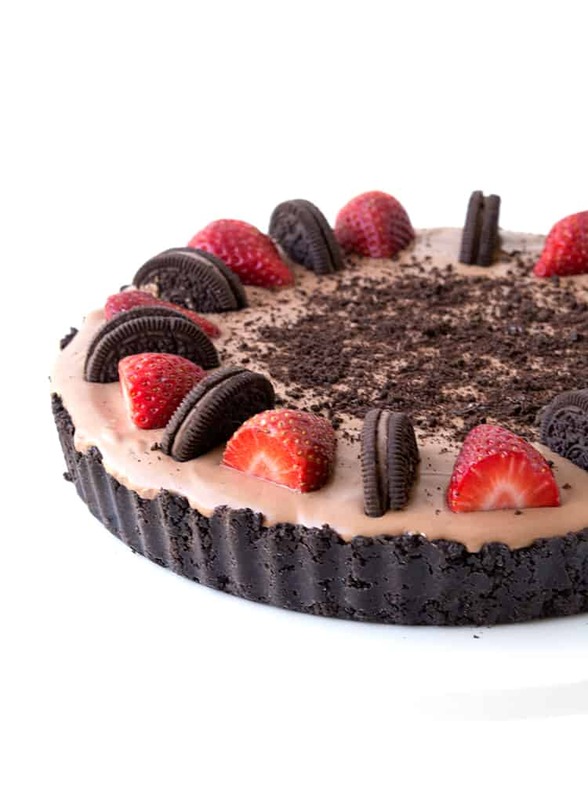 To serve, decorate top with extra strawberries and Oreos. Cut into slices and serve. Ooooh, this looks heavenly! Strawberries are so good at the moment so this would be so delicious! Thanks so much Kristy! I know aren’t ripe strawberries the best? And surprisingly hard to find at times! This is music to my ears… no bake AND less than 5 ingredients? Yes please! Umm…I am always going to say yes to pie. Especially 5 Ingredient no bake pie!!!! This looks amazing Jess and my fork and I can’t wait to dive in! Thanks so much Amy! Aren’t no bake desserts just the best!